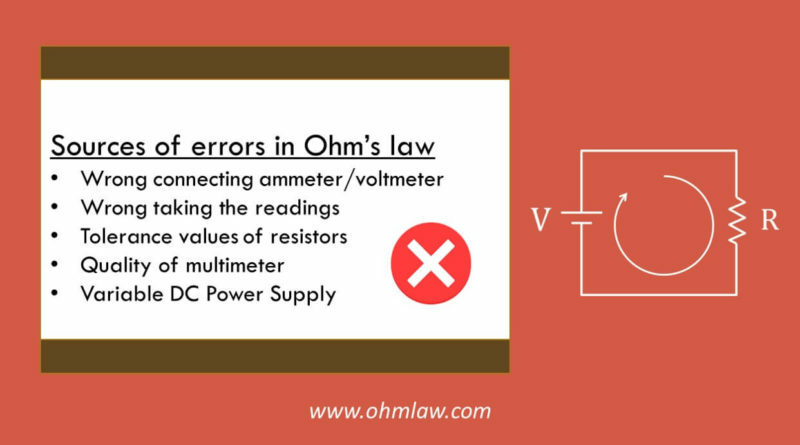 The practical observations of Ohm’s law experiment never match the theoretical readings. In fact, you can never match the theoretical calculations with practical values. However, you can take some precautions to closely match the values. Today’ you’ll learn the 5 error sources which are responsible for misleading readings. You’ll learn to keep you and your equipment safe by avoiding the blunders. You’ll also learn to obtain quite accurate readings. Let’s start off by understanding the types of errors. Personal errors: Mistakes made by the user due to his inexperience. Systematic: The faults in the instrument itself and the faults which may occur due to environmental conditions. Random errors: An accidental error whose cause is unknown. (We’ll ignore it here). The ammeter is used to measure the current. It always connects in series with the circuit. Wrong connecting the ammeter will damage the instrument. The voltmeter measures the potential difference between two points. It connects in parallel to the circuit. Wrong connecting the voltmeter will yield wrong readings. Wrong measurements usually happen due to careless handling behavior. Carefully take the readings to avoid the errors. Carbon and metal film resistors are the most popular class of resistors which are employed in our labs. Such resistors have a tolerance value which ranges between 0.05-20%. The leftmost band of carbon resistors indicates the possible tolerance of resistance. A silver band indicates a tolerance of 10%, the golden band indicates 5% and brown band indicates 1%. More tolerance means your resistance, and thus the voltage/current will fluctuate away from the theoretical value. You have two choices to bypass this error. Use a brown [1%] or grey [0.05%] band resistor which has low tolerance value and thus will provide a lower error. Measure the resistance first and base your theoretical formula calculations on this value. Your multimeter is the actual tool which measures the electrical quantities. While low-quality multimeters yield wrong observations, they are equally dangerous. Again you have two choices. A variable power supply displays the output voltages on its main screen. For the time being, the accuracy of components decreases and your supply might display wrong results. Such cases are common in general labs where supplies are used thousands of times. Use your multimeter to confirm the actual volts coming out of power supply.